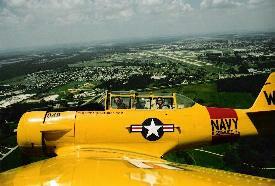 Warbird Adventures Kissimmee...If you like airplane rides this is a must do visit on your holiday plans. These are not simulators!!! They are the real thing. Come fly like the aces of yester-year in the Premier Fighter-Trainer of WWII, the North American T-6 TEXAN! Also known as the SNJ or Harvard, over 70% of the Allied pilots received their fighter training in these aircraft. This is incorporated alongside Warbirds, which both are located at the Kissimmee Municiple Airport. 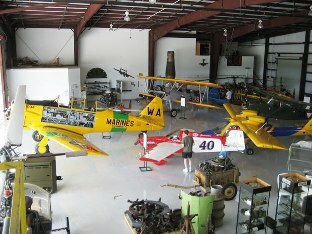 It houses vintage aircraft from World War II to the Vietnam War including an outdoor showroom. It is a working air museum with restorations of vintage aircraft in progress. When the Flying Tigers Warbird Restoration Museum closed in 2004 due to Hurricane Charley, Warbirds Adventures, saw a need for a museum and opened the Kissimmee Air Museum in 2007 and have never looked back since then. The air museum displays a number of vintage aircraft owned by the associated Warbird Inc. as well as on loan from private individuals and other organizations. Road map & directions...to find Warbird Adventures coming from Orlando, Kissimmee & surrounding areas. Opening times....Open 6 days a week 09:00 - 17:00 - closed on Sundays, Thanksgiving Day, Christmas Day & New Years Day. Flight prices/Bookings...Useful to know to pre-plan. Forums...Useful information with a personal touch. 1, 2, 3, 4. We will keep updating this page via our RSS feed regarding new additions, changes etc, so click onto the RSS feed to the left of your screen (no personal information required) to keep you on top off what's happening in and around Orlando, including news and information regarding Warbird Adventures.